In addition to their quick and perceptive grasp of spellcraft, even the humblest of High Rock's Bretons can boast a resistance to magic. Bretons can call upon the Dragonskin power to absorb spells. In addition to Flames, Bretons start with the spell Conjure Familiar. Bretons are particularly skilled in Conjuration, which means that they can summon creatures and weapons to aid them in battle. They are resistant to magic, making them exceptionally useful against other magic users. It should be noted that Bretons do not have any bonuses to Destruction magic, giving the player a fairer choice between using offensive magic or weapons; Breton skill bonuses are well suited for support magic. Many Court Wizards are Bretons. 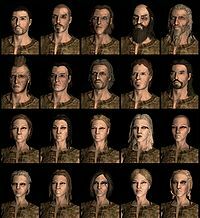 Also, numerous members of the College of Winterhold are Bretons. Bretons are especially common throughout The Reach. They frequently make appearances in a variety of roles, from traders to battlemages. There is a loading screen hint that incorrectly claims Bretons have 50% Magic Resistance, as was the case in Morrowind and Oblivion, but they have only 25% Magic Resistance in Skyrim. Between Agent of Mara, the Alteration perk Magic Resistance, and The Lord Stone it's possible for a Breton to passively have the maximum effective Magic Resistance of 85%, while this would leave any other race 15% short. Bretons are capable of reaching 100% Spell Absorption in the base game by activating their racial power and having the Atronach Stone. While game dialogue sometimes distinguishes between the natives of the Reach and Bretons, in-game data does not and all Reach natives (including Forsworn) are classified as Bretons. This page was last modified on 21 December 2016, at 17:58.